Tree of Life, Future Tense pays homage to the tree as a monument. 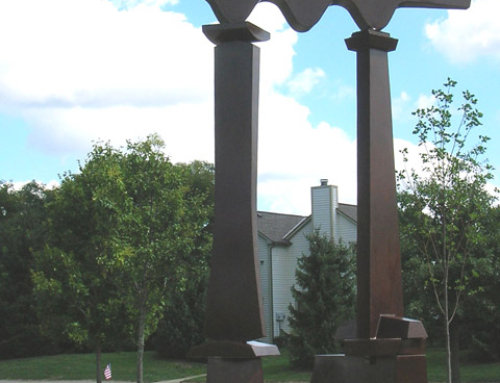 Columbus artist Mary Jo Bole encapsulates the visualization of time through a bronze cast sculpture that embraces a red oak tree planted within. Branches of the monument contain porcelain photographs of trees swallowing things, a foretelling of the artwork over time beyond the artist’s own lifespan. The sculpture’s bronze bark has engulfed items such as peach pits and praying mantis egg sacs, an imagination of the artist’s physical form altered and merging with the living tree. Student casters attached their own artwork, including cow skulls, cowboys and bronco rider figures inside as they welded the 80-piece sculpture together in Tucumcari, N.M.
Bole’s artwork encompasses sculpture, bookwork and drawings, often utilizing inspiration of geologic origins and intensive historical research. Bole has exhibited her artwork in the United States, Russia, Lithuania, the Netherlands, Sweden, England and Germany. She has lectured extensively about her work and a number of artists’ residences that she has attended and self-organized. Bole has a Bachelor of Fine Arts from University of Michigan, Ann Arbor, Mich., and a Master of Fine Arts from Alfred State College, Alfred, N.Y.